Two shelves in my refrigerator are reserved for condiments, bar-b-q sauces of every kind, mustards, Asian sauces, ketchups, dozens of hot sauces, etc. etc. A new addition, sweet chili sauce, is a result of our recent trip to Australia where it seems to be pretty much the condiment of choice. A sweet and spicy sauce of Thai and Chinese roots it has many flavorful uses. In Australia they serve it in its pure state, with burgers, Asian dishes, lamb and more, or they mix it with sour cream and serve it as a dip or serve it on cream cheese. 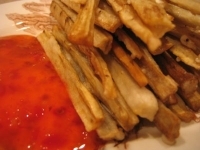 It is delicious with chips or "chups" as the say in Australia. As well as many other dishes. Once back in the States I embarked upon a quest for the best source for Sweet Chili Sauce. Star Tavern has been a favorite for many years. A recent dinner introduced us to some changes on the menu. The pizza is as good as ever. Those who have been there know. if you have not you must give Star Tavern a try. 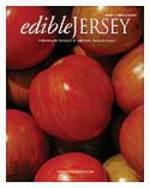 "edibleJersey" the new magazine and website published by Nancy Brannigan Painter is worth a long look. Seeking to support and promote local farmers and fresh local foods it is part of the national Edible Communities movement. With articles, events, recipes and more.